Knights of the Temple: Infernal Crusade Europe, 12th century AD, The Dark Ages. It is an age of suffering and salvation, pagans and saints, miracles and disasters. It is the age of the Knights of the Temple, trapped in a world where nightmares become reality and the celestial spheres of Heaven turn into the suplhurous pits of hell. Prepare for an infernal crusade. 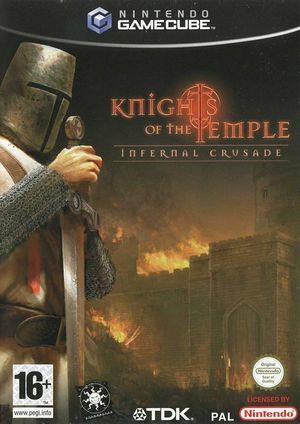 Knights of the Temple: Infernal Crusade has a native 16:9 display option, but it requires enabling it in its internal options and setting Dolphin's Aspect Ratio graphics setting to "Force 16:9". Using the widescreen hack with this title is not recommended. Flickers in-game with Auto aspect ratio. The menu backgrounds and other UI elements will sometimes flicker wildly or fail to render at all. This seems to occur more frequently when Dolphin is competing for CPU resources (i.e. using LLE audio, background video recording, etc). In the PAL-Version the 60Hz mode cannot be activated at startup. Use this AR code to force the 60Hz mode. The graph below charts the compatibility with Knights of the Temple: Infernal Crusade since Dolphin's 2.0 release, listing revisions only where a compatibility change occurred. This page was last edited on 21 April 2018, at 18:58.